Noinnar Mar Kum Waterfall (নইন্যার মার কুম ঝর্ণা), also spelled Nainnar Markum, is located in Sitakunda of Chittagong. This waterfall is also known as Noinnar Mar Kum Jhorna. Sitakunda is famous for waterfall as you can see couple of waterfalls in there. There are some other waterfalls around Noinnar Mar Kum Waterfall. So, if you plan to visit this place, you should see other waterfalls as well such as. Best time to visit: If you want to plan visiting any waterfall in Bangladesh, the best time is rainy season. Because in rainy season, waterfall get back their natural beauty with full flow of water. How to go: It’s better to go by bus. Ask the bus drive to drop you Sitakunda near Panthoshala (Panthochila). From there you have to take a walk to east side about one hour to reach the hillside. You can also take local transport upon availability. If possible, take a local person with you to reach the waterfall. 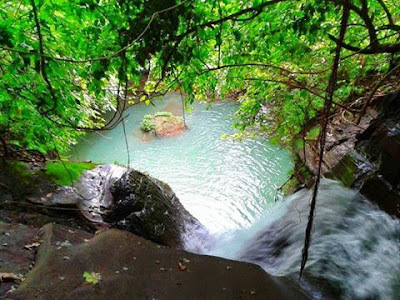 Noinnar Mar Kum Waterfall is located in the deepest part of the hill. So, you have to go through jungle. Where to stay: After visiting the place, you can go back to Sitakunda. But in Sitakunda, there is no such good hotel to stay. If you want to stay in better quality hotel, you can go to Chittagong city. Otherwise, here are some hotels in Sitakunda. You can also look for hotel in Baroirhat (বারৈয়ারহাট). There are some hotels to stay. The nearest place in Mirsharai which is widely popular for waterfalls.